A satellite image of the Bahamas with AIS ship density data from 2014, shows that Northwest Providence Channel is a major shipping route for ships transiting between the Atlantic Ocean and the United States. (The darker the lines, the more ship traffic; source: www.marinetraffic.com). The inset image shows how sperm whales are using the same areas within Northwest Providence Channel. These data are from 27 sperm whales that were satellite tagged between 2009 - 2013, and tracked over 1-2 weeks. 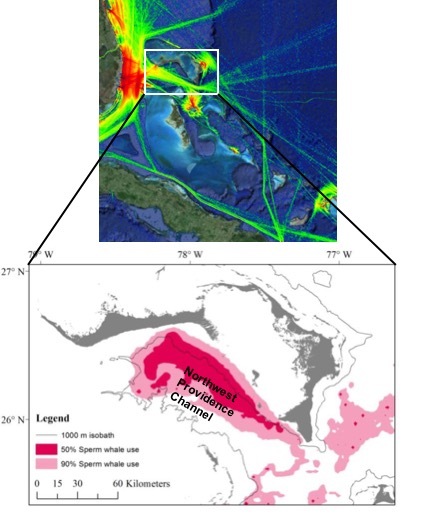 Shared Waters: how are resident sperm whales (Physeter macrocephalus) faring in habitat shared with increasing commercial shipping in The Bahamas. The population status of sperm whales (Physeter macrocephalus) is listed as endangered under the United States’ Endangered Species Act and vulnerable in the IUCN’s Red List of Threatened Species. 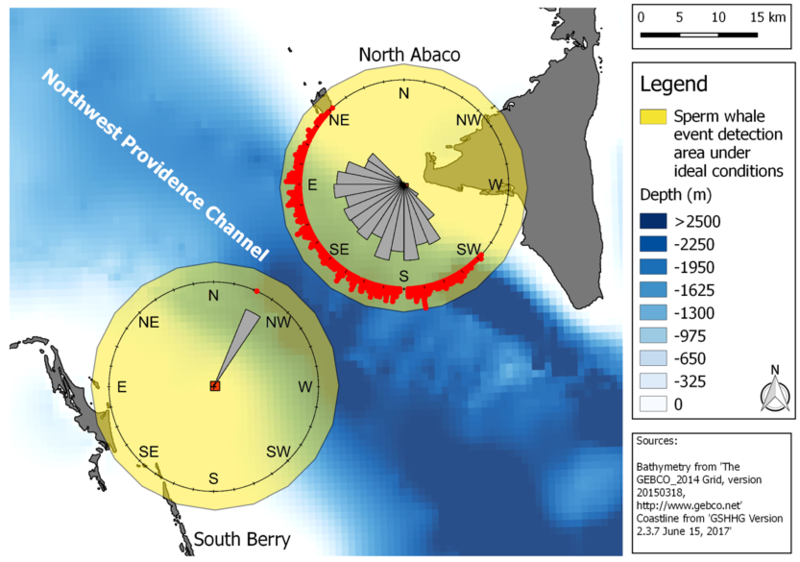 BMMRO's longitudinal studies in the northern Bahamas have shown that nursery groups (adult females and their young) of sperm whales reside there year-round, and exhibit long-term site fidelity to Northwest Providence Channel, an international shipping route. Currently, the impacts of ship traffic on the resident sperm whale population is unknown but ship density data and satellite telemetry studies suggest commercial ships and sperm whales are sharing the same waters, and that ship traffic is increasing. 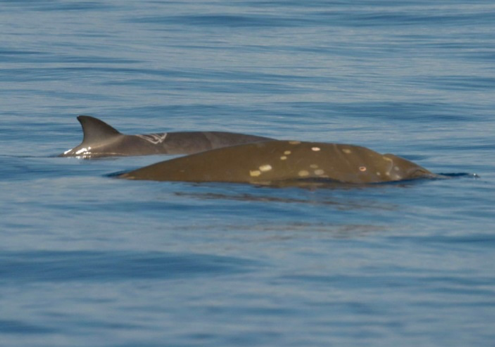 This project aims to quantify the noise generated by ships, predict sound exposure levels for sperm whales, and develop a place-based noise budget to limit impacts of maritime traffic on the resident sperm whale population. Of equal importance, we are providing a unique opportunity for Bahamian university students to play an integral role in a research project and assist in outreach with local primary and secondary students. 1) Aerial photogrammetry will be used to measure width profiles to directly assess individual body condition and detect pregnancy, and ground-truth inference about nutritional stress from hormone measures, with a particular focus on adult females, comparing those with (lactating) and without dependent young. 2) Hormone-derived identification of pregnancy will be used to ground-truth photogrammetric inference based on body shape. 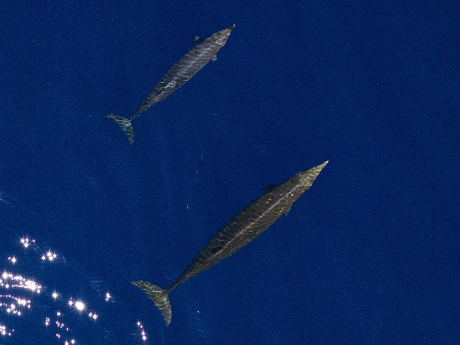 3) Aerial photogrammetry will be used to compare state-specific size (total length) and body condition (width profiles) of whales in Andros to the Abaco reference population (using data collected during the 2016 study, see Ongoing Projects, and data collected during future planned work) to investigate size differences as a potential indication of longer term nutritional stress.